And practicing being a show dog with our friend Deanna. Kipling has been working some show dog maneuvers with me, but this was his first session working with someone else. 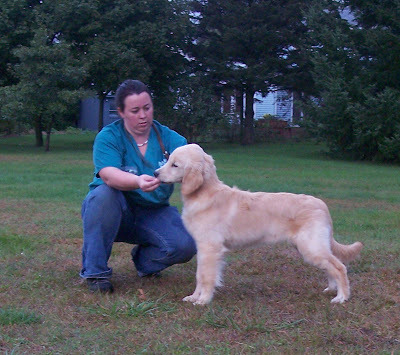 Kipling worked beautifully for Deanna and really didn't care where I was or what I was doing - even when I had to chase off a stray golden that wandered into our "show ring". I had tried a variety of setups on Kipling previously and we confirmed that he doesn't like the snake chain. The parachute nylon choke that I used with Teller was too narrow. I've got a thicker conformation choke that Teller won at a breed show that we'll try for next session. Deanna thought that Kipling had great body awareness and movement for a puppy of his age. Good boy Kipling!